Playing a humanitarian role in two of the world's biggest disasters and other major crises, Charles Sturt University (CSU) graduate Mr Andrej Verity has been occupied on a global scale in the year since he was awarded his postgraduate degree. The 34 year old Canadian completed a Master of Information Technology through Charles Sturt University by distance education at the end of 2009. He formally graduated from the Australian university in early 2010. 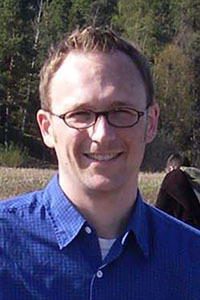 Mr Verity, an Information Management Officer with the United Nations Office for the Coordination of Humanitarian Affairs (OCHA) in Geneva, was sent to Haiti after a huge earthquake on 12 January 2010 devastated the small nation. About six months later, the CSU graduate was in Pakistan in the wake of massive floods which have been described by the UN as 'the largest humanitarian crises the UN and its humanitarian partners have ever responded to'. Although not deployed in person to the more recent crises in Libya and Japan in 2011, Mr Verity forged new ground for the UN in the valuable collection and management of information during humanitarian crises. In a 'first ever' for the UN, Mr Verity was appointed the strategic and technical lead in the OCHA's collaboration with the emerging Volunteer and Technical Community (VTC). In between this work since his Charles Sturt University graduation, Mr Verity found time to participate in specialist training so he can be part of the stand-by UN Disaster Assessment and Coordination (UNDAC) team. "This training enables me to be deployed by the United Nations to a disaster-stricken country within three to six hours to carry out vital assessments for and coordination of international relief," Mr Verity said. Born in the small Canadian town of Carnduff in the province of Saskatchewan near the border with USA, Mr Verity started his current position as an Information Management Officer with the OCHA in 2006. He was initially based in New York but moved to the UN headquarters in Geneva in May 2009. "OCHA is part of the UN secretariat with a mandate to coordinate humanitarian operations in response to emergencies. A lot of our work involves managing information after sudden on-set of disasters like in Haiti in 2010 or during more protracted emergencies such as in the Democratic Republic of Congo. "In my day job in Geneva, I provide support to the field-based Information Management Officers in various country or regional offices. This support could be technical in nature, strategic guidance or even staff recruitment. "During emergency deployments such as the Haitian earthquake and the floods in Pakistan I am responsible to ensure that OCHA fulfils its information management responsibilities. "For example, in Haiti, I was responsible for the management of humanitarian contacts of over 1 200 people in the first two weeks alone, the humanitarian community meeting schedule, the 'who does what where' products and general data liaison amongst partners. I also worked closely with the senior Information Management Officer on strategic issues. "When I was deployed to Pakistan, as the senior Information Management Officer, I took a very different role - convening and managing an Information Management network. The network involved humanitarian agencies, development partners, government and private industry, liaising with the cluster or agency leads to define information requirements, developing methodologies to determine critical data including the numbers in need of humanitarian assistance and the numbers in immediate life-saving need. "In my work with OCHA, I have also been involved with the development of information systems for OCHA's use to aid both internal and external Information Managers. "I am regularly looking at new approaches to our practices and introducing new solutions where appropriate and possible. I am regularly making my branch aware of various new trends or tools that we could consider – essentially taking on a thought leadership role. In 2009, Mr Verity outlined how the OCHA could use social media to aid in the achievement of their core mandate which resulted in a position being dedicated to its use. Throughout 2010, he also raised awareness of the possibilities of the OCHA collaborating with the VTC. "As a result on Tuesday 1 March 2011, I was given permission to begin collaboration between the UN and the VTCs in response to the conflict in Libya and the earthquake and tsunami in Japan. As a 'first ever' for the UN in a humanitarian response, the results were extremely positive." Read more about the collaboration here. Mr Verity is also a graduate of Canada's University of Saskatchewan where he completed a Bachelor of Commerce (Computational Science major) with Great Distinction in 1998. That same year he began work in a private IT consulting firm in the Canadian city of Calgary. "My advice for others contemplating further education is to make sure that the course you find fits you personally. You need to ask questions such as whether it will be flexible if you need to relocate and will the program allow you to pause if needed. "If you find a course that you are passionate about then it will make it much easier to sacrifice your time to do required work. There must also be a realisation that as professionals in our field, we should never stop learning. The more you try to learn, the more applicable you will be at work and the more indispensable you will be in the office. Education can make you a thought leader. "I was drawn to Charles Sturt University partly because of its flexibility," Mr Verity said. "Studying by distance education, I did not have to worry about being in a specific physical location thereby enabling me to continue with emergency UN missions. The program also recognised my past education and work experience. "The Master of Information Technology has helped me to better formulate my thoughts and has enabled me to, much more rapidly, develop and clearly articulate appropriate strategic options and directions. "I am now in a position where I can communicate more effectively with senior management as well as better understand their needs. From both the project management and technical side, it has helped me 'round out' my knowledge so that I can better prepare and manage any project. One of Mr Verity's lecturers from Charles Sturt University was Mr Anthony Chan. "IT is no longer just doing the network cables, collecting certification or writing software," Mr Chan said. "Our postgraduate IT management subjects are written so students can read, think and do. "In Andrej's case, he has to do all this in a very volatile, fast-changing environment where resources are very scarce. His ability to do things right and correctly the first time reflects in part the Charles Sturt University program where we develop our students in cultural competence, engagement of global citizenship and gives them an international perspective of their discipline. "There are many students performing critical tasks in their every day employment – this could be at the UN or in situations where you have thousands of customers online, or transactions being processed at lightning speed."